Starting with Iron Man back in 2008, Marvel decided to bring the world of comic books to movie screens in a way no one had before: by connecting all their different franchises to each other, creating a shared universe much like that of their comics; thus, the Marvel Cinematic Universe was born. In order to establish the MCU, though, they needed a framework, something that would run through most of their films to serve as confirmation that they all coexisted. The perfect vessel for that was the Strategic Homeland Intervention, Enforcement and Logistics Division, or SHIELD. SHIELD always has its hands in the superhuman goings on of the Marvel comic books, which made using it as the primary method of bridging the individual films of the MCU a no-brainer. As useful as SHIELD has been to linking these movies, however, it’s a tool that, improperly employed, can harm an individual film. So what is the proper way to use SHIELD? The answer rests in understanding the spy organization itself: essentially, they’re assholes. They’re secretive, they’re fascistic, they crave power, they bully people into playing ball with them – even the good guys – and they answer to absolutely no one, giving them free reign to make decisions for the rest of the world, whether we want them to or not. The better MCU films understand this and use SHIELD according to that paradigm, enhancing the movie by making SHIELD an annoyance at best and an impediment at worst. Iron Man has a very limited SHIELD presence, which is smart; this is the beginning of the MCU, as well as Shellhead’s introduction, so the emphasis has to be firmly on Tony Stark. Keeping SHIELD in the background helps to accomplish this, as well as makes them much more mysterious and imposing. Stark Industries has done a lot of business with the government before the start of the movie, supplying state-of-the-art weapons to the military and, most likely, to law enforcement and intelligence agencies, yet neither Tony nor Pepper Potts has ever heard of SHIELD. It shows that, as connected as Tony is, there’s a whole world of which he isn’t aware, and SHIELD is a big part of it. The most telling moment, though, is the final scene, when Coulson gives Tony a cover story to sell to the press. When Tony hesitates, then announces to the world, “I am Iron Man,” it’s Marvel’s drop-the-mic moment, where they let the audience know that their movies will be different than what’s come before and they’re not afraid to break with superhero tradition. And who is it that doesn’t want Tony to do this? SHIELD. They are the obstacle he has to overcome to be the great character with whom moviegoers continue to fall in love, and by extension the obstacle Marvel itself must overcome to tell the stories it wants to tell. It’s interesting, then, that Iron Man 2 uses SHIELD so poorly (aside from the symbol appearing on a computer screen, they sit out The Incredible Hulk). Tony’s second outing has a host of problems, but SHIELD’s function is one of the most damaging. They aren’t the impediment this time; they’re the solution to all of Tony’s problems. They dump the answer to Tony’s failing health right into his lap and force him to work on it till he discovers the new element for the arc reactor. Tony’s rebel loner personality, so cool and fun and symbolic of the MCU as a whole in the first movie, is portrayed here as his biggest shortcoming, and he needs the firm hand of SHIELD to smack him back in line. That’s messed up in itself, but what’s even worse is that SHIELD’s rights-stomping tactics are employed in full force. They infiltrate Stark Industries via Black Widow, lock Tony up in his own house (while disabling any outside communication, so if they wanted to kill him he wouldn’t be able to call for help – not that they probably would, but the key word there is “probably”), they threaten him with physical violence if he attempts to leave and they force him to work for them. These are actions totally in line with SHIELD’s modus operandi, but the problem is that they’re presented as being in the right. The impediment to Tony’s success this time is Rhodey, his best buddy, who steals one of his suits and delivers it to evil Justin Hammer. This should’ve been SHIELD’s role, trying to possess technology to which they have no right and seeing it blow up in their face – perhaps subcontracting Hammer because he seems so willing to do what he’s told, in contrast to Tony’s rebellious nature – while Rhodey talks Tony down from his self-destructive ledge. Moreover, SHIELD handing Tony his father’s work robs him of the opportunity to discover it for himself, making him a dull, passive protagonist (a big problem when the protagonist is a superhero). The way SHIELD functions in this film is wrong on every level. Thor, by contrast, gets SHIELD exactly right. When Mjolnir embeds itself into a rock in the New Mexico desert, a bunch of locals crack some beers and try to pry it from its resting place. It’s a fun scene, and you can imagine yourself trying your luck at lifting a mystical artifact that landed in your town just as these guys do. Then Coulson arrives and the first thing he does is cordon off the area, send everyone home and take possession of the hammer (as much as someone unworthy can). What right does SHIELD have to a hunk of metal that fell out of the sky? None, obviously, but they ruin everybody’s fun because of their desire for control. There is a logical argument, of course, that they want to make sure it’s not radioactive, but that’s just a pretense; SHIELD wants it because it has power and they’ve designated themselves the bearers of power on earth. They also quickly locate Jane Foster’s lab and confiscate her equipment and all the work to which she’s devoted years of her life, not even considering simply asking for her help; intimidation isn’t their last resort, it’s their only resort. When Jane says they have no right to take her things, Selvig warns her off not by arguing that they do have the right to take it, but that trying to stop them would end badly for her. Unlike Mjolnir, there’s no reason for them to take Jane’s property other than to cover up the incident. They’re bullies, and they get away with it because they’re so powerful that someone like Jane can’t fight them. Their real function in the movie, though, is revealed when Thor tries to get his hammer back. At this point, Thor believes that being worthy of lifting Mjolnir is based on his skills as a warrior, so battling his way through an army of SHIELD thugs fits with his perception of Odin’s test. They’re the obstacle he has to overcome to get to Mjolnir, and he makes short work of them. He can’t lift it, of course, because his worthiness is about his heart as opposed to his muscles, but the point is that SHIELD serves here as the agent of conflict, both for Thor and, as in Iron Man, the audience. Thor wants to get the hammer; we want Thor to get the hammer. SHIELD is keeping both us and Thor from our desired result. In the end, when Thor’s godhood is restored, he tells Coulson that SHIELD may consider him an ally, but only if they get their act together and stop exerting their power over the weak; this is exactly the lesson Thor has learned over the course of the movie, that power is not what makes you a hero, but helping others. SHIELD personifies Thor’s bad qualities, his arrogance and abuse of power, and because he’s overcome those attributes he has an honest view of what SHIELD really is, and he expects them to shape up. Like Iron Man, Captain America: The First Avenger has a very minimal SHIELD presence, but when they’re around they’re up to their usual tricks (namely deception and control), keeping Steve Rogers completely in the dark when he wakes from his ice-induced coma. He has to forcibly escape from SHIELD’s New York facility to discover the truth about his time warp. They would have told him eventually, of course, but still, they set up an elaborate lie because they think they know what’s best for him, it doesn’t work, and they immediately make Cap wary of them. Once more, they are the obstacle the hero has to overcome, this time to learn the truth about himself and the world around him. The Avengers gets SHIELD right in a big way (as you would imagine, since it comes from the man who gave us the Alliance and the Initiative). SHIELD gathers Earth’s Mightiest Heroes and gives them a noble mission: get ahold of the Tesseract before a crazed rogue god and his alien army use it to take over the world. Once it’s in their possession, though, their true goal becomes clear, and once again, it’s power. The heroes all have their own reasons for distrusting SHIELD – they breach Tony’s security and walk right into his home; they lie to Banner and coerce his help while trying to find a way to kill him; they ask Thor to do things a man who’s just discovered his honor wouldn’t do (namely, torture his own brother); they act so secretively that, once Tony and Banner point it out to him, Captain America’s antennae go up. When the heroes investigate, they find that SHIELD is using the Tesseract for much the same reason as Loki: they want to harness its power to make themselves undefeatable. Nick Fury says that they need a check against the “people who can’t be matched,” but there will, in turn, be no check against SHIELD. This group of spies that doesn’t answer to anyone will have unlimited power, just like the people Cap fought so many years before. This is the impetus that gets the heroes to abandon SHIELD and fight Loki and the Chitauri on their own. They’re not interested in trading one dictator for another; they want to save the world from all would-be conquerors. This is also the film where we see that individual agents of SHIELD are capable of great heroism, but only if they remove themselves from the shackles of their masters. Black Widow is with SHIELD because she wants to erase the evil things she did while working for the Russians, but as Loki points out, SHIELD is no better, they just happen to be the opposing team. (“You lie and kill, in the service of liars and killers.”) She begins to make up for her past when she joins the Avengers and fights to save people, not to shift the balance of power. Hawkeye, similarly, wants to atone for his actions while under Loki’s thrall and finds the chance by fighting with the Avengers rather than staying under lockdown with SHIELD. 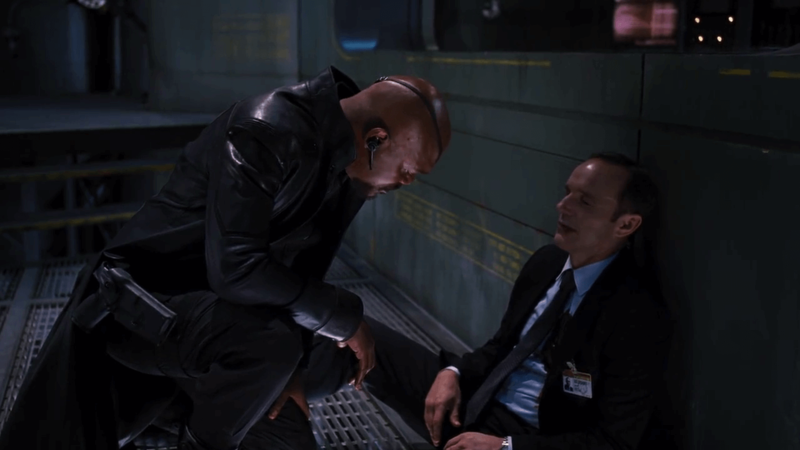 Coulson, invigorated by being in the presence of his greatest hero – Captain America – finally steps out from the shadows and sacrifices himself to try to stop Loki, even getting in one good hit while he sits on the floor dying. Nick Fury, weary from his string of deceptions, defies the SHIELD council and refuses to nuke Manhattan to stop the alien invasion, then finally jettisons his cloak-and-dagger mystique by warning the Avengers of the incoming missile. The individual SHIELD agents aren’t necessarily bad people, but they are corrupted by the organization of which they are a part and, once they turn their backs on the spy apparatus, they are capable of heroic feats. Captain America: The Winter Soldier dovetails off this concept beautifully by showing us a SHIELD that has been penetrated at the highest levels by a Nazi organization (the go-to symbol for fascism) that is using SHIELD’s power to establish their own. When the enormity of Hydra’s infestation of SHIELD becomes apparent, Fury simply wants to weed out the bad guys and go back to business as usual, but Captain America finally, firmly tells him that’s not the answer. SHIELD is corruptible because SHIELD, as a concept, is corrupt, and the only way to truly keep the world safe is to get rid of SHIELD once and for all. (It’s no coincidence that the head bad guy is played by someone who, forty years ago, would’ve fought to expose SHIELD and Hydra while romancing Faye Dunaway; Robert Redford’s moral fiber is inversely proportional to his proximity to SHIELD). This is the end of Natasha’s journey to becoming a real hero instead of just a spy, and it’s the biggest step yet in Cap’s quest to restore honor to a world he no longer recognizes. When Cap tells the SHIELD rank and file of Hydra’s plans, he implores them to stand up to the vipers in their midst, to dig deep and find their inner freedom fighters; like Black Widow, they need to stop being spies and be heroes. It works (because how could a speech from Captain America not work? ), and the good people who work for SHIELD stand tall on their own, not in service to a shadowy organization, and fight for the ideals they hold in their hearts but that SHIELD and Hydra tried to strip away. Once they turn on SHIELD, they finally help Captain America make a difference. All of this is why, even just conceptually, Agents of SHIELD doesn’t work; it turns the people who function best as antagonists into the heroes. 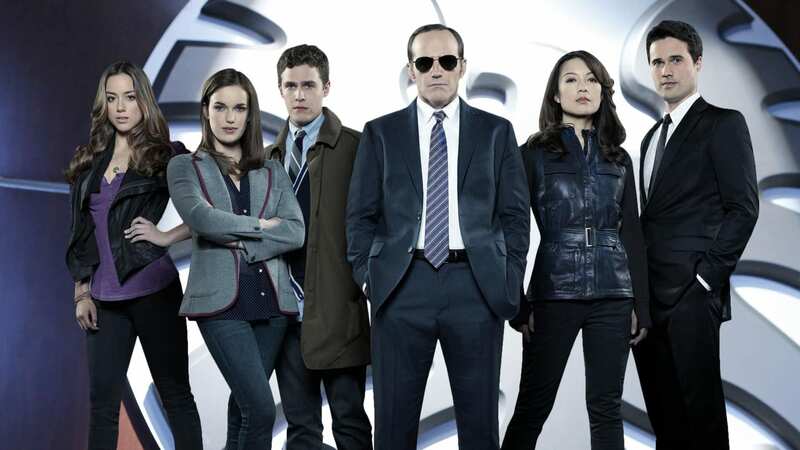 Coulson’s actions in The Avengers are possible because he rebuffs SHIELD and takes his own initiative. On the show, he and his team are slavishly devoted to SHIELD, to such an extent that they sound like fanatics. He and Robert Gonzales feel like two psychotic zealots fighting for control of a cult. Not once does either of them mention any motivation other than their allegiance to SHIELD and the direction in which they want it to go, and the same is true of their subordinates. They are everything Captain America accused SHIELD of being, and like in the deeply flawed Iron Man 2, we’re being asked to root for them. There are a host of problems plaguing Agents of SHIELD, but this is the big one, and the reason it never really gelled, at least for me. SHIELD has played an indispensable role in forming the Marvel Cinematic Universe, and whether or not it’s present, its effects can be felt any time one movie references another. Like any other tool, however, it can be disastrous when used improperly, and a vital element of any Marvel movie that employs SHIELD’s services is an understanding of its function in the MCU.